Artist House is made up of two fully furnished private apartments. 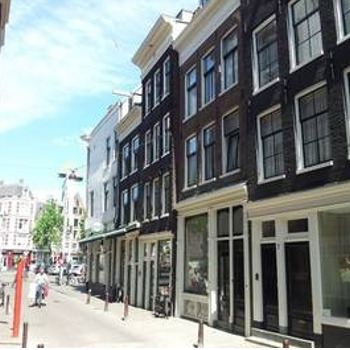 The apartments are located in the Nieuwmarkt district, which is one of the oldest districts af Amsterdam, close to Central Station and the city centre. Both apartments have been renovated (in 2012) to a high standard and offer modern and contemporary feel. Both with newly fitted kitchens and bathrooms and benefit from a roof terrace with stunning views the city. I am not sure I should be reviewing these apartments as it might make it more difficult to book in the future! These apartments are in the Nieuwmark district. They have recently been renovated to a very high standard. It has a small kitchen area with everything you would need if you wanted to cook, including a microwave and nespresso machine. It even had a dishwasher. There is a table and chairs and a sofa. The TV has many channels, including BBC. The bedroom is at the back and once there, you can't hear the street noise. The bathroom has a bath and shower over it. Toiletries are included- right down to toothbrushes and toothpaste. A hairdryer is included. A big bonus is that the apartments have Wi-Fi. The owners have gone out of their way to be welcoming. We arrived early and they were happy to keep our bags till the apartment was ready. We wanted to find our way to a sports hall where OH had to collect his things for the marathon on Sunday. Arvin didn't know how to get there but went off to find out for us. When we did arrive back to our apartment we found a vase of perfect roses and a big bowl of fruit. Also provided was a nespresso capsule selection box and a similar one for tea, which must have had every possibility under the sun. There was also a tin of waffles. The apartment was absolutely spotless. The location is ideal as its two minutes to Chinatown and 10 mins walk to the Dam area. Almost all of the site seeing is walkable to. We had a 3 day metro ticket, which was at a discounted price, but didn't use it as often as we thought we would. The photos show exactly what it looks like. Will we return- yes, that is if they are not fully booked already.